Pablo Picasso stated, "Every child is an artist. The problem is how to remain an artist when he grows up." Children are born creative souls. From the time that they can see and hear, they are sponges, soaking up their surroundings and trying to make sense of the world. As they process these sights and sounds, they need a way to converse with the outside world. They do this first through their facial and verbal expressions and, as they grow, through their words and then their artistic expressions. Art is a way to express their feelings. Using hands, eyes and mind, they are able to make visual what they feel internally. Art is disciplined, hard work and, at the same time, is the sheer joy of creatively "messing about." In the early childhood programs of Reggio Emilia, Italy, art is considered another language. The teachers there feel that children are capable of a hundred languages and want to use them all, so they are given different mediums in which to speak. 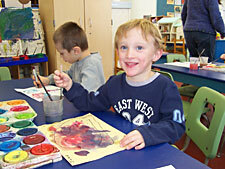 Messages are expressed through clay work, painting and drawing, music and movement, and so much more. Art stimulates children's ideas, which is especially important for young children who are just learning to use language to communicate. Art helps children examine the complexities of the real world in small, manageable pieces. By allowing children many languages in which to give voice to their innermost thoughts and feelings, we are respecting their lives and their very beings. 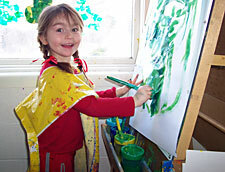 Children begin artistic expression as early as one, according to Anne Mitchell of The Bank Street College in New York. Early on, children have the ability to use symbols to make one thing stand for another. This capacity becomes refined at ages three and four, and is reflected in their use of language, art, and symbolic play. A few lines or circles on a piece of paper represent something, and the world of artistic creation has opened up. Just as in play where we see progressive stages of social interaction in children, so too is the development of a budding artist. The large, muscular "scribble" movements of a two-year-old become the fine-grasp line drawings of the four-year-old. The up and down brushstrokes of the infant become the detailed strokes of the five-year-old. Offering many tools to use for children's self-expression opens doors for them that would have otherwise remained closed. Adults need to remember this as we look at children's artwork, and appreciate the messages that children convey through their art. We need to provide every opportunity that we can to allow for children to express themselves through art. We are fortunate in Brattleboro to have a wealth of artistic knowledge here at our doorstep. Our community fosters the development of children in all domains, including creative expression. The Month of the Young Child art exhibit at the River Garden was created to educate the public about the benefits of the creative energy that abounds in this town. Whether it is casual art experiences at early childhood settings, or formal art classes at the schools, our children are learning that there are many ways in which to communicate, and this exhibit says it all. Please visit the Month of the Young Child art exhibit opening at the River Garden on Friday, April 7, from 5 to 8 pm. Sponsored by The Early Childhood Council and the Early Childhood Educators Network, the artwork will be on display throughout the month of April. Gretchen Horton Kuebler is Coordinator of Program Support for the Windham Child Care Association.